Above: Unusual Granite Belt Form In Situ, No Aerial Roots. Right: Granite Belt var. hillii. Below: Flower. Variety hillii starts its journey from around the town of Buladelah, 200kms north of Sydney. This spot is also the end of the line northwards for var. speciosum, the southern neighbour of var. hillii. Although the two varieties end up quite close to each other, intermingling of the genes is not easily detected. In the normal course of observation, var. hillii remains pure and so does var. speciosum. It is likely that intermingling does occur of course. In the vast Barrington Tops region to the west of Buladelah, var. hillii is the only form present. At the northern limit of var. hillii, in the vicinity of Nambour 100kms north of Brisbane Qld, this variety does overlap with its northern neighbour, var. grandiflorum. The mixing of the genes between them is obvious if you see enough specimens. Just because you are standing in this zone does not mean for certain that the plants you see are hybrid speciosums. I have several specimens given to me that came from the Conondale Range near the Jimna region, and north of the imaginary line. These I classify as straight var. hillii plants. Between the Buladelah and Nambour districts, var. hillii is a commonly encountered orchid. Var. hillii does not seem to cross to the western side of the Great Divide. Apparently there once existed an island colony of var. hillii on a large granite and rainforest outcrop near Gosford on the NSW Central Coast, 150kms south of Buladelah and just 70kms north of Sydney. This isolated colony is well reported by knowledgeable observers of the past, but I have no personal experience of it. I am told that it is now all gone; destroyed by a large quarry. Variety hillii is rather easy to identify, even when not flowering. The pseudobulbs are much on the skinny side and invariably long and tapered, up to a full metre to the first leaf. Aerial roots are usually very dominating. In some cases, the whole plant can become almost buried by the mass of upright roots. Even young seedlings develop the aerial root habit once they reach three or four years old. When it happens to grow on rock the aerial roots seem to abate to a large degree but remain none the less obvious. In the granite country around the NSW-QLD border, there is a different looking form of var. hillii. This is cold country at around 1000ms altitude. Mostly it is snow gum country. But here var. hillii occurs on large granite boulders and they look for all the world like typical var. speciosum plants from southern NSW. The pseudobulbs loose the typical var. hillii form altogether. The aerial roots have disappeared as well. Around these parts var. hillii does not take to the trees. In the very deep gorges that run away from the ranges, it takes to the trees again with aerial roots and remains the typical var. hillii form. The difference between the two granite denizens is the altitude they live at. Often they will only be a few hundred metres apart . . . but that measurement is in metres of altitude. It is in the flowers that var. 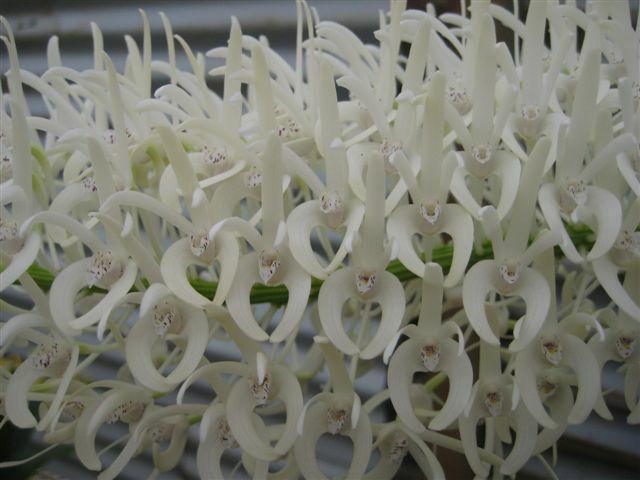 hillii sets itself apart from the other eight varieties of D. speciosum. If any of the varieties deserve splitting off into species in their own right then var. hillii is a lay down misere as they say. Racemes have no trouble growing to 600mms in length and can be upright or quite pendulous. But it is the sheer number of flowers that adorn the raceme that impresses. There can be up to 400 or more blooms on a single, robust raceme. The flowers themselves rarely exceed 25mms from top to bottom. However, they really pack on to the raceme. Some forms manage to space themselves out just right and present very nicely. Others are so crowded that they actually overlap each other and will not open widely. Once again the forms from the granite belt country on the state border are different to the norm. Up there the flowers are slightly larger and quite sparse on the raceme. This granite country form really is different in most regards. The more I write the more I think someone should look more closely at it. Damn! I might just have a go myself . . . that’ll spur someone into action! Var. hillii flowers are virtually always white. Some are a dirty white and a few may be a very pale cream if you squint your eyes late at night. Two or three very rare albinos are known. But there are no known yellow forms to my knowledge. If you are tramping about the overlapping zone with var. grandiflorum, around the Nambour-Bunya Mountains longitude, you will often see yellowish blooms on small flowered plants. There is no doubt that such plants are certainly not pure var. hillii. Confusion is easily experienced in this zone. The flowers on such plants are often slightly larger as well. So be careful with your conclusions. Poor old var. hillii . . . nobody loves it. Very few serious speciosum growers bother with it. I put myself into this group. I don’t know how many flowering size pieces of D. speciosum I have in my 2 large bush houses. Perhaps 300, but it might be closer to 500. I doubt that there would be 10 specimens of var. hillii among them. There are reasons for this I have finally realised, after several decades of being a knocker myself. As I travel the shows, I see a fair few speciosums in the springtime. Every now and then someone will put a lovely pot of var. hillii on the bench. These must be judged as var. hillii, not just as a speciosum. So small flowers come standard and a var. hillii cannot be expected to have 75 mm flowers and be deep yellow. A judge has to put personal preferences out of his or her mind. During the last four or five years some cracking var. hilliis have turned up on the bench. Two have been awarded. Of late, I have started taking a hell of a lot more notice of poor old var. hillii. So why has it taken so long for me to come to this point in my growing career? In the bad old days of the 70s and 80s, millions of var. hillii plants came on to the market place. These were by-products of the rainforest-logging industry. But that all ended in 1986 with the total protection of rainforests. Nearly all the supply dried up. When it was available, a lot of var. hillii were tied to a slab of timber, sometimes upside down, stapled to a board, or stuck into a pot of Cymbidium mix. They ended up looking terrible and nursery hands had no idea how to care for them. This turned me from them; they had small flowers, they were always knocked around and many closed up from anther cap abuse, which turns them off quickly, etc etc etc. I am sure the rest of the world thought like me as well. So the world and I ignored them. There is another reason for my lack of interest in var. hillii. All the other varieties grow profusely on rocks. 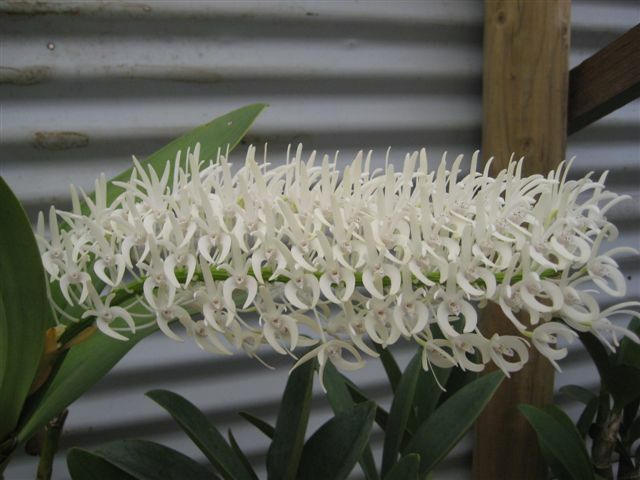 You can get amongst them in the flowering season and see which ones are worth a second glance. Var. hillii will grow on rocks as well but nowhere near as rampantly as the others. This is mainly due to fact that, over its range, not a lot of rock face is available in the first place. Of course there are a few spots where there are a lot of plants on rocks. But I think it is fair to say a very small percentage of var. hillii plants are seen on rock when looking over the whole 800km range of its distribution. So where do you go to check out a big population of them in the flowering season? I certainly know nowhere off hand. I know a few spots with a dozen or so clumps sitting on cliff edges or big boulders. Certainly there is not enough to mount a big trip to see them. But there are many thousands of them in the trees of every creek and gully and river catchment over the whole of the range. It is truly a spectacular sight to see the trees turn white with them in the spring. But you don’t get close enough to see if there are any show winners in the mix. Even if you did see a good one, you “might as well try and catch the wind”, to quote Donovan Leitch, England’s answer to Bob Dylan. Your next step is to pick up a random piece from a fallen tree and take it home. When it flowers it will be under whelming no doubt. Var. hillii is very commonly found on the ground this way. Tonnes can be seen roting away at times; quite literally. The chance of finding a really good form in this way is remote. Still, good ones turn up from time to time. It is the only way possible in the main. To sum up, you rarely run across startlingly good plants on the show bench. When you do see one you will certainly remember it. So I’m going to make a much bigger effort from now on with poor old var. hillii. You should take more notice too. Var. hillii is likely to turn up nearly anywhere that a piece of wet bush is found. The really big stronghold for it is the upper reaches of our big river systems, but at low to moderate altitudes. This is not an orchid that climbs to the top of the ranges, although it will at times. It is not very coastal either, but it is possible to see it like that. It prefers low to moderate altitudes a fair way inland. Find a She Oak lined river or creek, beyond the last farm, and you are in prime country to see var. hillii. There are parts of the Barrington Tops where many individual She Oaks support tonnes of var. hillii. And I am not exagerating with the word tonnes. It is like this all the way to Queensland. Finally, and keeping with the theme of neglect for this form, I am embarrassed to report that I have no photos of var. hillii in situ to show you. So endeth the lesson.